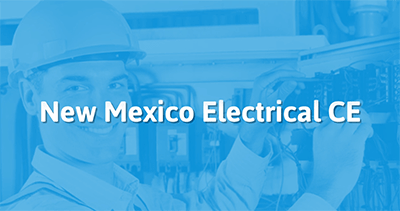 Our New Mexico electrician continuing education online course is approved by the state of New Mexico Electrical Bureau to satisfy your continuing education requirements. Take the continuing education to renew your NM electricians license today. All of our courses can be completed At Your Pace Online to help you meet the state's requirements to maintain your license. Once you finish your class you will have an official certificate of completion to save for your records, and we will report your course completion to the state for you. In the state of New Mexico, licensed electricians are required to obtain 16 hours of continuing education every 3 years. 8 hours must cover Code updates. The other 8 hours can be industry-related CE, or more Code Updates. This course is designed to help you meet your continuing education requirements by covering changes made to Chapters 1-3 of the 2017 NEC. The course has been approved by the State of New Mexico and will be reviewing code for the following subjects - General & Definitions, Wiring & Protection, and Wiring Methods & Materials. This course is designed to help you meet your continuing education requirements by covering changes made to Chapters 4 & 6 of the 2017 NEC. The course has been approved by the State of New Mexico and will be reviewing code for the following two subjects: Equipment for General Use, and Special Equipment. This course is designed to help you meet your continuing education requirements by covering changes made to Chapters 5 of the 2017 NEC. The course has been approved by the State of New Mexico and will be reviewing code for the following subject - Special Occupancies. This course is designed to help you meet your continuing education requirements by covering changes made to Chapters 1 & 2 of the 2017 NEC. The course has been approved by the State of New Mexico and will be reviewing code for the following two subjects - General & Definitions, and Wiring & Protection. This course is designed to help you meet your continuing education requirements by covering changes made to Chapters 3 & 7 of the 2017 NEC. The course has been approved by the State of New Mexico and will be reviewing code for the following two subjects: Wiring Methods & Materials, and Special Conditions. This course is designed to help you meet your continuing education requirements by covering changes made to Chapters 4, 8, & 9 of the 2017 NEC. The course has been approved by the State of New Mexico and will be reviewing code for the following two subjects: Equipment for General Use, and Communication Systems. The New Mexico Regulation and Licensing Construction Industries Division Electrical Bureau reviews all submissions of Continuing Education providers and Instructors for competence and content in compliance with New Mexico statute and rules regarding continuing education requirements for certified journeyman electricians working in New Mexico. This letter in association with the list of approved CEU Providers as it appears on the RLD.CID.NM.US webpage (link provided) for continuing education shall serve as bona fide to all who seek to verify assurance of approved providers for New Mexico.